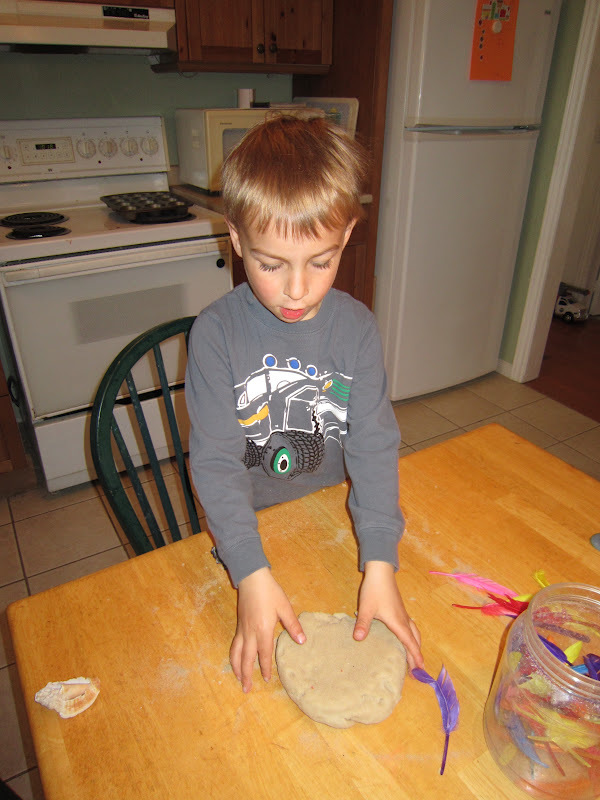 Here is one variety for our typical No cook play dough. We simply left out the drink powder, as I often do if we don't have anything on hand, and added some sand to the mix. The kids also loved sprinkling sand on the table to add in. Some other ideas you could add would be glitter, or rice for a new texture. Get creative because you really can't go too wrong here. I've even tried different flours in the recipe too. Instead of getting out the typical play dough toys, we used shells, rocks and other natural objects. Cousin E thoughtfully adding more shells to her creation. Thanks for visiting today I would love for you to leave a comment. What else do you do with play dough?